Is the West trying to create friction between Russians and Goans? When India liberated Goa from Portuguese tyranny in 1961, the Salazar regime approached the UN Security Council for help, and it was only a Russian veto that helped avoid a major international confrontation. It’s a pity that many in Goa don’t even know about this. I shrugged off a suggestion from a friend, who had worked for more than two decades in India’s Intelligence Bureau, that “western agencies” were involved in the cancellation of the Great Live International Music festival in Goa. I have never been a fan of conspiracy theories and always thought they were the result of minds that just weren’t occupied enough. But this former agent may not be so off the mark when he claims that there are some vested interests when it comes to making life difficult for Russians in India’s idyllic state. Over the weekend, a local edition of a leading Indian daily published an article where some Goans accused Russian tourists of littering on a beach. The tourists assumed that Russians who come to the area were the culprits. Why shouldn’t they blame it on the Russians right? We, Indians, are known for our civic sense. Cities like Mumbai, Delhi and Bangalore are the cleanest in the world. We never throw rubbish out of car and train windows. We take tremendous pride in our country and never do anything to make our streets and the natural attractions dirty. In fact, our municipal authorities work really hard day and night to make sure that India is one of the cleanest countries on earth, don’t they? Sarcasm aside, it is obvious that there is a problem in Goa. A constant misinformation campaign has led to a series of popular myths. For starters: the theory of a “Russian invasion” of the state. I usually ignore ignorant people who form their opinions based on rumours, but when a good Goan friend of mine got off on this tangent, I took him on. The young man from Mapusa said his cousin who runs a hotel in north Goa lost clients because a Russian set up a hotel next door and managed to steal away the Russian clients. He went on and said, the Russian man is married to a Goan and has a Person of Indian Origin (PIO) card and that what he’s doing is not really illegal, so his cousin couldn’t even report this to the police. This friend argued that some foreigners were even naturalised Indian citizens and there was nothing that could be done to stop this “colonization.” When I asked whether Indians who immigrate to the UK and the US and become citizens are colonialists, he didn’t have an answer. This young man was just misguided by an aggressive media campaign that seems to be in part funded from somewhere. That brings us to the question as to why a third party would want to create a rift between Russians and Goans. My guess is quite simple. Many countries on the other side of the Cold War divide resented the fact that New Delhi was a staunch ally of Moscow. In fact, some believe that India’s bloody partition was a result of the West wanting a friendly regime in the neighbourhood. At a time when there were hostilities between the USSR and the West, people in the former were cut off from westerners and western culture. They had a lot of access to Indian culture and Russia basically produced a few generations of Indophiles right up to the 1980s. Enter 1992, Indian films vanish in Russia, the West comes flooding in and dominates the cultural landscape. From the early-1990s, Russians came less and less in contact with India and Indians. Political relations between Moscow and New Delhi had also cooled. But then came Vladimir Putin and his pro-India policies that single-handedly lead to ties warming again. But those that were keen to divide us didn’t mind since people-to-people contact had come down to a trickle. Between 1992 and 2000, the Western media and its Indian counterparts had managed to poison ordinary Indians about Russia. This seemed like a perfect plan to turn India and Indians completely pro-West. Goa managed to swing the momentum back in terms of people-to-people engagement. Many Russians who started using Goa as a base to visit India also started feeling comfortable with the country and ventured to places like Hampi and then came back to visit the north. What could be a better way for the West to create friction between the countries than to manufacture problems in Goa? There’s the old adage that a lie repeated enough times would be accepted as the truth. So a constant misinformation campaign would lead to Goans being resentful of Russians and make them feel unwelcome and once again move away from India. If only if it was this easy for the West to turn Indians into puppets! 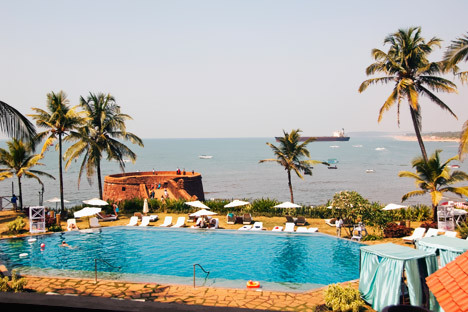 Goans are, in general, easy going and fun-loving, but they are not fools. Most people in the tourism industry appreciate the fact that Russians have contributed to the state’s economy. The state has always been liberal and there’s nothing to suggest that an ordinary tourist from Russia is involved in anything that a Goan would consider immoral. The people of Goa are also smart enough to know that the drug trade and prostitution are very much activities headed by local criminals and unscrupulous politicians. The only people who have a problem with Russians in the state are tourist touts and the taxi mafia (along with their political backers) who think it’s their birthright to cheat tourists, local or foreign. These groups could very well be “encouraged” by those who want to damage Indo-Russian relations, but they are very unlikely to scare Russian tourists from visiting the place often called an “Indian Paradise.” None the less, vigilance in this area wouldn’t hurt.